Wifestyles Blog & Photography: 19 weeks! I seriously can't believe I'm almost HALF WAY!!! SO crazy! I feel like we just found out yesterday! This bump of mine is growing like crazy! I can honestly say I fall more in love with this little babe everyday! We had an amazing 4th of July weekend hanging by the pool, eating grilled food and hanging out with family! I can't wait for Liam's first 4th next year! How far along: 19 weeks! Almost halfway there!!! Weight gain: 3-5 lbs! I go back Friday for my 20 week ultrasound so I'll find out for sure then! Maternity clothes: A few! I've basically been living in maxi dresses! And I still use the rubber band trick for my pants! Stretch marks: So far so good!!! I've been using my stretch mark oil like crazy! Belly button in or out: Out! It sticks out so far lol! Sleep: I still need lots of sleep but it's getting WAY more uncomfortable! Especially now that I'm not supposed to be sleeping on my back! Plus I always have the urge to pee 500 times a night! Miss anything: Being skinny lol! He's so worth it though! Movement: YES!!! Seriously the best thing I've ever experienced! Hoping Justin will be able to feel him soon! Cravings: Hmm... lets see... EVERYTHING! I'm always, always hungry! But seriously- anything FRESH! Fresh garden tomatoes + mayo + toast = the best creation on the planet! Looking forward to: Our 20 week ultrasound on Friday and getting away for the weekend with my love! You look adorable! Maxi dresses are the best, especially when you are pregnant. I was huge in the winter so I was wishing I could take advantage of maxi dresses, but I basically lived in tights! 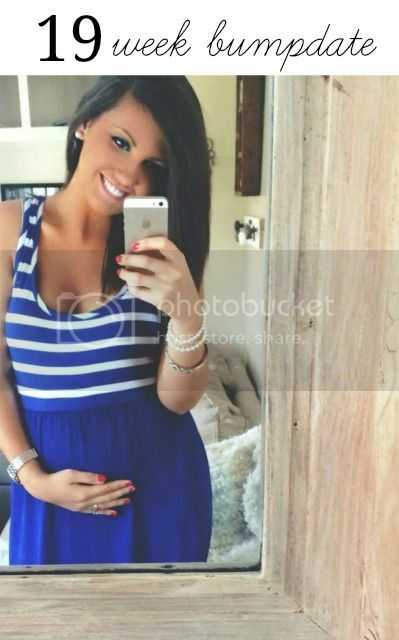 Seeing your bump pictures always brings a smile to my face. You are adorable! I did not feel anything until week 24...so exciting you felt it early. It's the best part! You look fantastic! Feeling the baby move around is one of those things that I really miss- best feeling ever! SO excited for you! you look great! :) I hope that you and Justin have a wonderful weekend away this upcoming weekend! AHHH looking gorgeous and glowing!!! We fully instill Asics Running Shoes Sale Asics Running Shoes Sale spiritual power. Soon force roar. On roaring at this time. Whole blood screen giant ball while being issued a roar of sound. north face outlet online I listen north face outlet online to you. Prince knew the opportunity came, it was God helping themselves. Heart, extreme north face outlet online excitement, seem to see the corpse lying on their feet cheap. Brothers are used to sell, and this north face outlet the north face outlet online sentence damn true. Black man put away the pistol, and then i said a few ear Prince, Prince nodded his head toward the bar. sale yet. Prince came into the bar to greet a waiter asked. sale just north face outlet online go out and do not know where he was. The waiter replied truthfully. Is not with a woman. Yes ah, north face outlet online kinda nice too. Is not a sale north face factory outlet ah, I see two very good match. The waiter did not know what north face outlet online he said exactly what . tiffany uk sale you hurry to tiffany uk sale drink ah, I'll drink you cross on the circle. discount slowly eating the food, but not to touch the share of millet gruel, dean heart anxious, anxious to put small tiffany london sale rice coming down hard tiffany uk sale discount stomach. He already horny, following long hard like Tiechu. And also ate dinner before a tiffany uk sale aphrodisiac, tiffany uk sale it is the desire to rise.